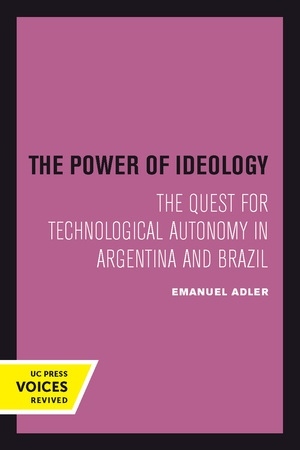 In this prodigiously researched book, Emanuel Adler addresses the hotly contested issue of how developing nations can emerge from the economic and technological tutelage of the developed world. Is the dependence of Third World countries on multinational corporations—especially in the realm of high technology—a permanent fixture of an inherently unequal relationship? Or can it be managed by the developing nations for their benefit? By a masterful comparative study of the development of science and technology in Argentina and Brazil, the author discusses governmental policies that are effective in attaining autonomous technological development. Professor Adler provides a useful corrective to the structural theories of development that have up to now prevailed in the study of international relations by demonstrating that intellectual and technological elites play a far more significant role in the success or failure of such governmental policies than has hitherto been recognized. This title is part of UC Press's Voices Revived program, which commemorates University of California Press’s mission to seek out and cultivate the brightest minds and give them voice, reach, and impact. Drawing on a backlist dating to 1893, Voices Revived makes high-quality, peer-reviewed scholarship accessible once again using print-on-demand technology. This title was originally published in 1988. Emanuel Adler is the Andrea and Charles Bronfman Chair of Israeli Studies and Professor of Political Science at the University of Toronto.